The Luck of Friendship - Description | W. W. Norton & Company Ltd.
A friendship struck in 1942 would last for forty-one years through critical acclaim and rejection, commercial success and failure, manic highs, bouts of depression, and serious and not-so-serious liaisons. 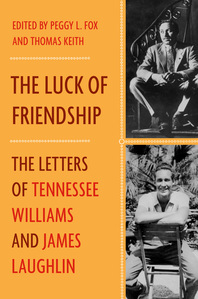 Tennessee Williams’s and James Laughlin’s letters provide a window into the literary history of the mid-twentieth century. Lavishly illustrated, The Way It Wasn't offers an intimate firsthand encounter with 20th-century Modernism, from the extraordinary man who defined it for America. A sparkling, lively record of a remarkable author/publisher relationship.